After years of utilizing social media, we’re turning our learning lessons into something productive for fellow nonprofits to benefit from! 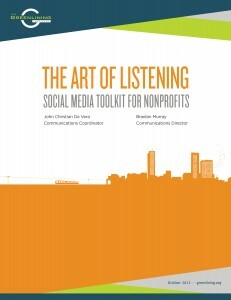 Through this toolkit, nonprofits will be able to learn tips and best practices for crafting an intentional social media strategy. The strategy guide is broken down into the seven critical elements of crafting a social media strategy, and is complete with a glossary of social media terms and a comprehensive list of clickable tools and resources. The importance of social media cannot be ignored – these tools have the incredible potential of strengthening advocacy and organizing work for organizations. To read the report, click here.